This is, hands down, the most inexpensive beer I have ever bought. The six pack ran me a grand total of four bucks. That's cheap. So cheap, in fact, that I thought it may be bad. No offense to Saranac, but the only one of their brews I've had is their Pumpkin Ale and, while it's not the worst pumpkin beer I've had (Blue Moon holds that distinction), it's not my thing. My dad hates Saranac's Pumpkin. I mean, as a rule he doesn't like pumpkin ales. But Saranac's was the first one he had and it poisoned him against the stuff. 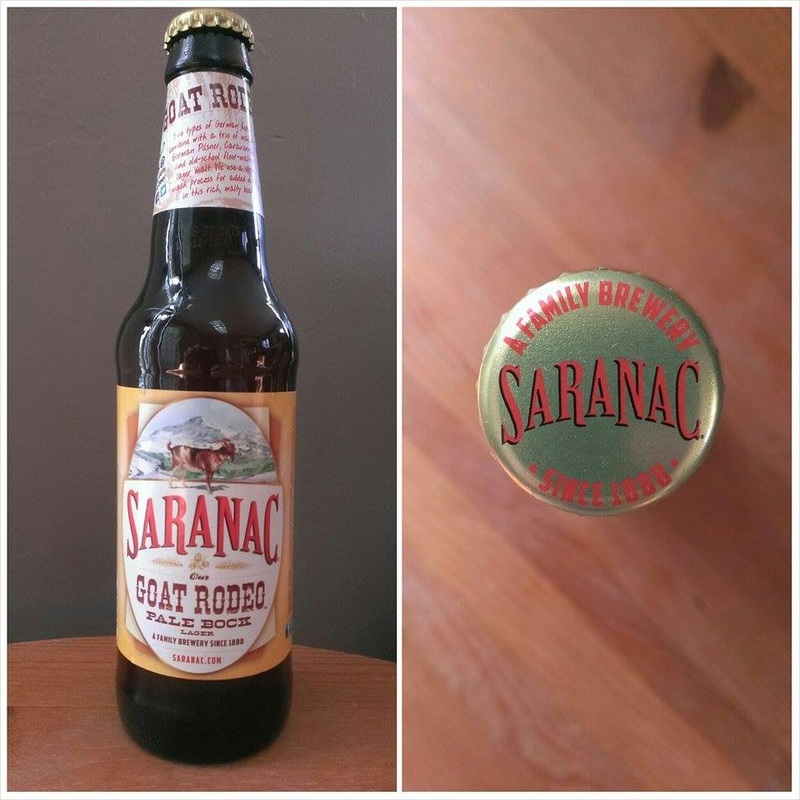 I love pumpkin ales, though, but even I had my doubts when I saw the $4 price tag on Saranac's Goat Rodeo Pale Bock Lager. Surely good beer isn't so cheap. The price tempted me into buying it. If it turned out to be terrible I could pitch it without feeling bad, right? Saranac is a family-owned brewery based out of Utica, New York that can trace its roots back to 1888. However, the Saranac name itself didn't come about until 1984 as a type of specialty (now known as "craft") beer. The brewery has its entire history on its website if you want to check it out which I recommend doing. There's a lot more there than I can quickly paraphrase on my blog. The brewery also lists its beers online. Should you desire to look for Goat Rodeo on there don't bother. It isn't listed (believe me, I went through every category to find it and had no luck). It's part of a special Brewer's Choice series. I don't know how widely available this stuff is. I also don't know if you'll be able to find it for the price I did (it was obviously on clearance when I purchased it). Since it doesn't exist on saranac.com all I know about the bock comes from the label on the bottle, which says the brew has two types of German hops and three types of malts (German Pilsner, Caravienna, and lager malt). It also says the bock is 6% ABV. Nothing about the aroma or flavor. That means that, as far as those two topics are concerned, the sky's the limit and nothing I discern is wrong. Woohoo! Goat Rodeo smells a little bitter. I also get somewhat of a murky aroma. If I'm really grasping at straws I can find a slight sweetness/fruitiness in the scent but the most powerful aspect of this is the bitterness. Think IPA aroma bitterness, only more dim. 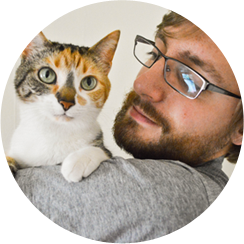 Purrl, for her part, gave it 6 sniffs. She must like it. 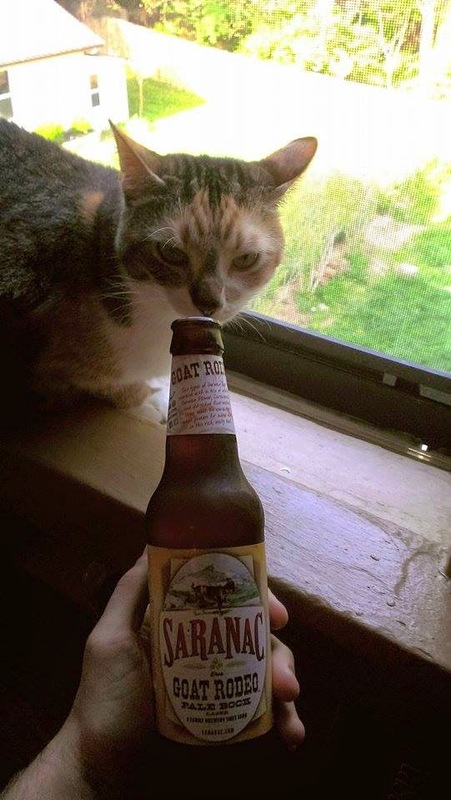 Saranac's Pale Bock has a starchy quality to its flavor. It tastes like a bock should taste--not too overpowering but you know its strong. The tail end of its flavor is sugary. It's an odd, unexpected quality that I find adds to the brew. I really don't get any sense of fizz from Goat Rodeo. I see bubbles in the bottle but they're not enough to translate into anything in my mouth. It's a smooth, drinkable lager. I didn't eat pancakes for a long time. I ate them plenty as a child because they were quick and cheap for my parents to make, making them a go-to dinner in my household. But, for some reason, I disliked them. So much so that my parents eventually stopped making them for dinner altogether when I was home. Last year or so my girlfriend suggested buying pancake mix and making them because they're cheap and we're pretty poor. I told her that I didn't like them but I'd give them a try, for her. When we made them (and when we make them still) I find myself enjoying them. I can't explain it--maybe my tastes have changed or maybe I like making food with her--but pancakes have become one of my favorite foods. Saranac's Goat Rodeo makes me think, probably because of its sweetness, of pancakes and my girlfriend (who convinced me to give them another shot). I like it, and not just because of what I spent on it, although the price is certainly part of my reasoning. Goat Rodeo Pale Bock Lager gets an 8.0 from me. Swing by Jungle Jim's if you're in Cincinnati anytime soon and see if you can find some.